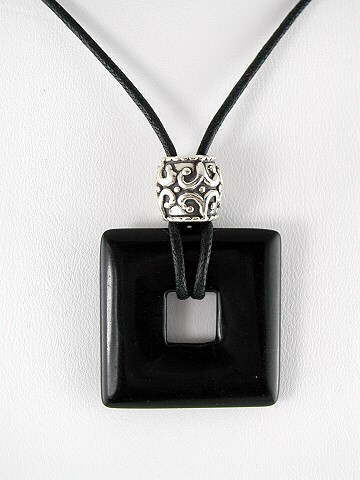 Striking Black Onyx geometric pendant set with a substantial 925 sterling silver filigree bead and finished on a 20" black waxed cord thong necklace. Onyx is known as the Stone of Strength - mentally and emotionally; giving support to the wearer during difficult or trying times. It is said to have the ability to hold on to the energies and memories of the wearer, making it excellent for psychometry work, but it can also be used to access past life memories; enabling us to recognize hurts from a previous incarnation, therefore allowing us to see the negative patterns which we may have brought through into this life which need to be released and so healed. It also balances the masculine and feminine parts of our nature, and can bring strength where fear is present. Onyx is part of the Agate family, and although most commonly found in black or white colours, it can also be grey, blue, brown, yellow and red.